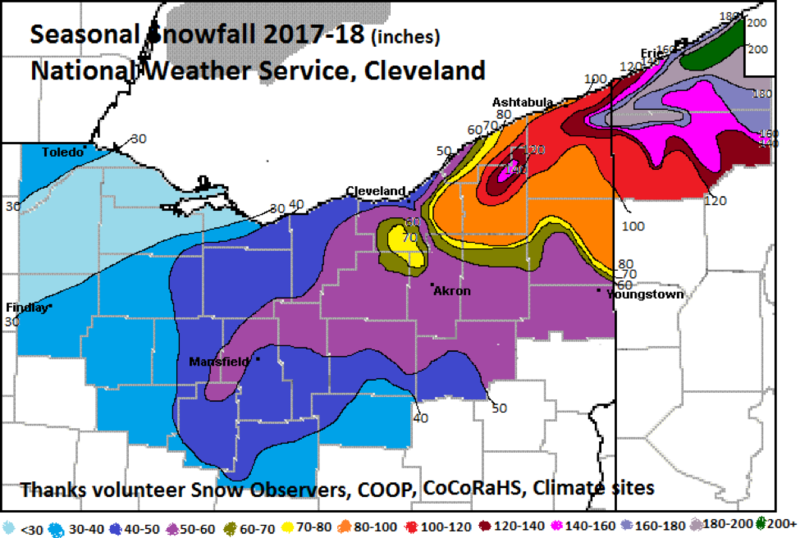 When we look back at the winter of 2017-2018 in northern Ohio and northwest Pennsylvania, two things will stand out: the record amount of snow near Erie, PA and that winter hung on to the bitter end through April. We consider meteorological winter to be December through February. Temperatures were well below normal for a relatively short part of the winter, from Christmas Day through mid-January. During this time, readings dropped below zero in many areas. February turned warm. Remember the 70-degree day on February 20? Overall, temperatures for the winter were slightly above normal. Of course it got cold again in March and stayed cold through April. This would be meteorological spring (March - May). The March - April stretch will go down as one of the coldest ever. Snow was light to moderate much of the winter. Aside from a few lake effect events (and one really big lake effect snow), there were no large snow storms. A couple of systems brushed the counties south of the turnpike with 4-6 inch snowstorms, mainly from Akron to Canton and Youngstown. The duration of the snowy weather into April ended up bringing seasonal snow to near normal levels with above normal amounts from Akron to Youngstown and in the snow belt. Of course, the granddaddy snow storm occurred in Erie, PA. Starting on Christmas Day, it snowed for about 60 hours and added up to about 50 inches. Remarkable! The meteorological winter season (December through February) of 2017-2018 was characterized by alternating stretches of very cold and warm weather. Snow totals for the winter season averaged near to slightly below normal, with temperatures through the three months averaging close to normal. The winter began very mild with the first five days of December featuring highs in the 50s and 60s. This quickly shifted to a much colder, and at times snowy pattern, through the rest of the month. A stretch of cold arctic air toward the end of December resulted in a few daily temperature records. There were several Alberta Clipper systems that dropped light snow mid to late month. This added up to above normal snow amounts for the month of December. January was also a month of temperature extremes and fluctuations in the weather as very cold and warm were experienced at times. The first 18 days of January were overall very cold with temperatures as much as 20 to 30 degrees below normal. The last 13 days of the month trended the opposite way with temperatures well above normal. This offset the cold start with temperatures overall close to normal for the month. There were no major storms with precipitation and snowfall below average. A cold and snowy first half of February gave way to unseasonable warmth for the second half. A winter storm dropped between 4 and 7 inches of snow on far northwest Ohio on February 9. Several other clipper systems produced accumulating snow which led to above normal snow totals for the month. Occasionally wet and mild conditions then become the story after February 17. Although November temperatures didn’t stray too far from seasonal norms, many locations in southwestern and central Ohio didn’t see their first measurable snow of the year until December. What has been the case for the past several winters, the snow was a bit tardy in its arrival for much of southwestern Ohio and central Ohio, at least until the second week of December. While many locations normally see the first measurable (at least 0.1” of) snow in late November, the first widespread measurable snow of the season didn’t arrive until December 9, when much of the area received generally 1-2 inches This would be the start of what would end up being a fairly cold and snowy December for much of the region. Although the worst of the cold didn’t arrive until after the Christmas holiday, there were several winter storms (or at the very least systems which brought accumulating snow to the local area). An arctic blast that arrived in the area on Christmas Eve brought rain which changed to snow and produced a few snow squalls in southwestern and central Ohio. There were even a few reports of thunder snow on Christmas Eve as the snow and snow showers moved through the area. Although most areas received an inch or two, some reports of up to 3 inches were received. What would follow the arctic blast of Christmas Eve was an unusually long and particularly frigid cold stretch, with temperatures that were well below normal for the next two weeks. With this extended bout of cold air came several days with accumulating snow throughout the area, especially December 29-30, when 2-5 inches of snow accumulated as a system tracked through the region. The cold stretch to end 2017 continued right into the New Year. In fact, from December 26 through January 6, the temperature did not reach 20 degrees at Dayton or 25 degrees at Columbus. This stretch of 12 consecutive days not reaching at least 20-25 degrees is the longest such stretch on record at Dayton and Columbus, respectively. The 13 consecutive days of not reaching 30 degrees from December 25 through January 6 at Cincinnati was the sixth longest such stretch on record for the site. The bitterly cold start to January, however, came to an end by the 7th as a much warmer air mass moved into the region. From this point forward, while there would be periodic cold stretches, nothing would really come close to the cold at the end of December into the beginning of January. In fact, temperatures soared to near 60 degrees by January 10 and again later in the month. Average temperatures as a whole never recovered from the brutal cold of the first six days, but January average temperatures did end up fairly close to normal. Even after temperatures warmed up a bit, a snowstorm on January 12-13 brought 2-6 inches of snow to much of the region. Another event on January 15 brought another 2-4 inches for many locations. The flip of the calendar to February didn’t bring back any real winter cold. In fact, for most of the month, the local area saw nothing but unseasonable warmth and even some record warmth. Temperatures reached into the upper 70s on February 20 and Cincinnati even hit 79 degrees – a February record for the city. Monthly averages as a whole were generally 6-7 degrees above normal across the region. As such, there wasn’t much in the way of any significant snowfall or winter storms, except for on February 7. A complex winter storm brought 2-4 inches of snow for parts of the local area, with more snow towards central Ohio and more ice further south and southwest. February 2018, however, will be most remembered for the several heavy rain events which led to significant flooding and river flooding across much of the region. Several bouts of heavy rain, including on February 24-25, led to rapid and high rises on area waterways, leading to the most widespread and severe river flooding that has been reported in parts of the Ohio Valley in years. Widespread rain of 2-4 inches fell on top of already saturated soils during this period. Although March and April are typically thought of as “transition” months, these two months of 2018 felt more like a regression back to winter. A very cool weather pattern settled in for most of the two-month period, yielding more light snow events and keeping the severe weather mostly limited to just a few events. The several light snow events in March and April ended up bringing seasonal snow totals to very close to normal for much of the region (20-25 inches). It was a slow a start to winter snow-wise, but the first week of 2018 started out cold with temperatures nearly 10 degrees below average. The temperature roller coaster swung the other direction in February with most climate sites recording their all-time highest temperature in the month of February. Zanesville reached 78 degrees on February 20. January 12 low pressure tracked up the Appalachians combined with a strong arctic cold front to produce a significant rain and snow producing storm for eastern Ohio. Ahead of the front, a strong southwesterly moisture feed and mid-level short wave brought heavy rainfall to the area, with 2-3 inch storm total rainfall reports common. This rain created strong rises on area rivers and streams, with several gauging points reaching flood stage. Also, the strong river rises broke up ice on these waterways, creating significant ice jam concerns. The strong arctic cold front passed through during the afternoon and evening of January 12, bringing a flash freeze to area roads that were wet and water-covered from the rain. A mix of sleet and freezing rain developed during the evening with minor ice accretion reported. Precipitation then changed to all snow and continued into the morning of January 13 before tapering to snow showers. A swath of 6-8 inches of snow fell from southeast Ohio. On February 6-7, Low pressure moved up the western side of the Appalachians Tuesday night, February 6, into the morning hours of February 7. Initially the precipitation started as snow across the upper Ohio Valley. As the warm air surged north, precipitation type changed to a wintry mix of sleet and freezing rain. Eastern Ohio switched over to freezing rain. Ice accumulation was around a quarter of an inch for these places. December was a dry month overall, with 50-70 percent of normal precipitation observed. Despite the lack of precipitation overall, much of the area received near normal snowfall, 2-4 inches. Most of that snowfall fell during the last week of the month. Temperatures ended up slightly below average for December, with a notable cold wave after Christmas. Overnight lows dipped into the lower single digits during that time, with high temperatures only rebounding into the teens and 20s. January began very cold with low temperatures dropping into the -5 to -10 degree range across many locales for much of the first week. High temperatures only recovered into the mid-teens during that span, as dry arctic air dominated the region. This cold spell was interrupted by a brief but significant warmup on January 11-13, when temperatures eclipsed 60 degrees each day. This was short-lived as another arctic air intrusion overspread the area with teens for highs and 0 to -5 degrees for lows. This outbreak was accompanied by 3 to 6 inches of snow that blanketed the region. Temperatures moderating to more seasonal levels for the remainder of the month with no significant precipitation observed. January ended up 3 to 6 degrees below normal with near average precipitation and snowfall. While the first 7-10 days of February were below normal (especially for lows), the month overall turned out to be a complete opposite of January. A pattern change mid-month allowed much warmer and wetter weather to move into the region. Temperatures the latter half of the month managed to top out in the 60s and 70s for highs several days with precipitation (mainly rain) occurring on eight of the last 14 days. Temperatures for the month averaged 5-7 degrees above normal with precipitation 300 to 400 percent of normal observed. Most cooperative observing sites ended up with their wettest February on record. Snowfall was generally 1-2 inches below normal. The winter season as a whole was near normal for temperatures and considerably above normal for precipitation, primarily because of the very wet February. Seasonal snowfall was close to average. Many cooperative observers experienced a top 15 wettest winter, again primarily due to the very wet month February.